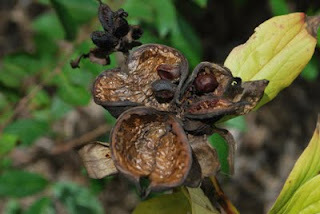 Today I gathered the peony seeds from their pods. It was a dismal year for seed production. With all of the rain we had during the peony bloom season this year, open pollination was greatly reduced. The rain caused many of the blooms to rot. I was about a month late collecting the seed this year. So a couple of varieties of seed may have been lost because of my delay. From over 50 blooming varieties, I ended up with seed from 8 of them. The most notable was seed from 'Coral Charm'. I will be curious to see if the seed is viable. Only spring will tell..